THANK YOU CARDS BULK : Our cards speak of sophistication and elegance. 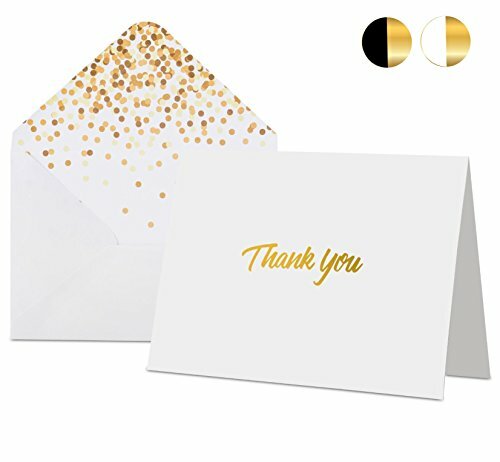 A bold minimalist gold foil letterpress "Thank You" makes these a smart choice for those looking for a modern card for any occasion. SIZING : Perfectly sized to give you just the right amount of space to write your heartfelt message. Card is 5.75" x 4.1" and envelope is 5.9" x 4.25"
VALUE FOR MONEY : Best value for your money!! The set comes with 100 cards with lined envelopes. YOUR SATISFACTION IS OUR PRIORITY! If you have any questions about this product by Paper Dot, contact us by completing and submitting the form below. If you are looking for a specif part number, please include it with your message.